See all DVD Previews at www.mediate.com/Views. 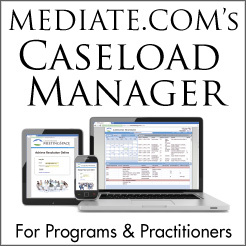 Join Jim Melamed, CEO of Mediate.com and Former Executive Director of the Academy of Family Mediators, for 15 hours of divorce mediation instruction. This course emphasizes a facilitative and maximizing approach. A 300+ page manual and outline are available. "The ability to update my website myself whenever I wish, with no need to contact a "webmaster" to make changes,is enormously convenient. The website is very user-friendly, and the support staff is always responsive and helpful."